Hello and thank you for coming to see my map of the fifty united states and their official mottos. It is made from hand-carved linocuts, each approximately 9×12 inches, that I carved, printed, and scanned to make an original map projection. The map has been featured on National Geographic Traveler’s blog, in the coffee table book Mapping America, and in a music video for kids. Order a full U.S. map off of Smokey’s Tangle’s Square shop. I offer a 30×40-inch archival digital print on rag paper for $300 as well as a 16×20-inch cardstock poster for $30. Buy a poster in person at Concept 47 in Oakland (map) and/or San Francisco (map), or at my studio Smokey’s Tangle (by appointment). Order an individual state print. 11×14 inches, digital archival on rag paper, $50. Each state can be viewed individually on the purchase page. Free custom colors for multiple prints. 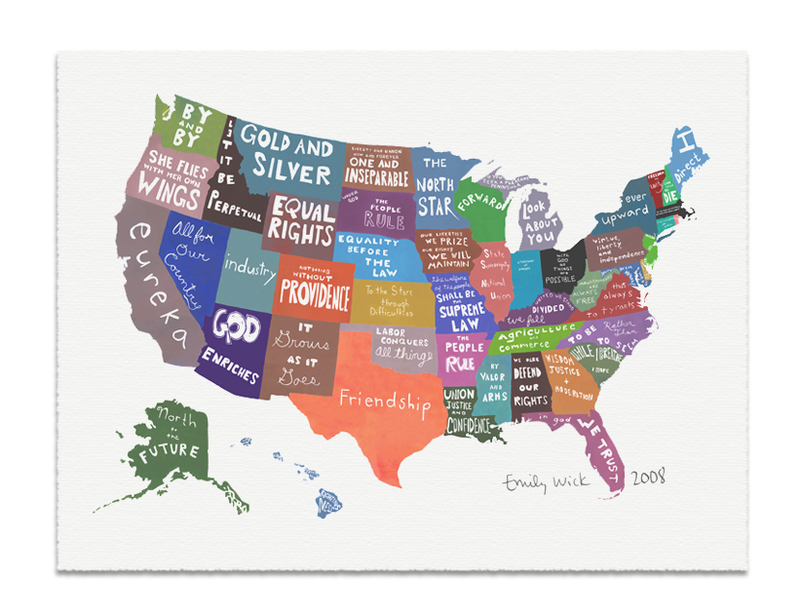 Many people purchase one from each state they’ve lived in. About me: visit my website and blog emilywick.com for my latest work and an “about the artist” page.
! !Thank you for visiting fiftystatesmottos.com! !